This is a bicycle simulation game featuring advanced bike physics. 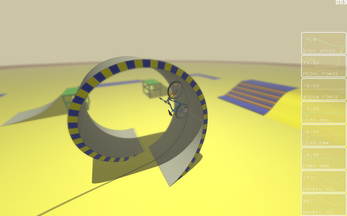 The player uses gamepad to set the lean angle, and the game will use the handle bars to reach that lean angle. 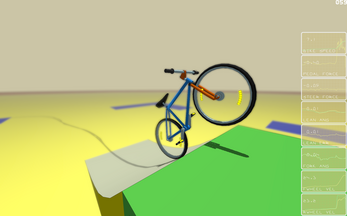 A full and accurate physics simulation, running at 240Hz, gives the game a realistic feel. Separate control over front and rear brakes gives the rider the possibility of doing stoppies, and with lean backward, wheelies are possible. And with ramps, 360 flips, front and back are possible too. RIGHT STICK: LEAN FORWARD/BACKWARD, LEFT/RIGHT. Gamepad (SDL2 supported) strongly recommended. Press gamepad's (A) button to skip 'FAILED' or 'SUCCESS' screen. 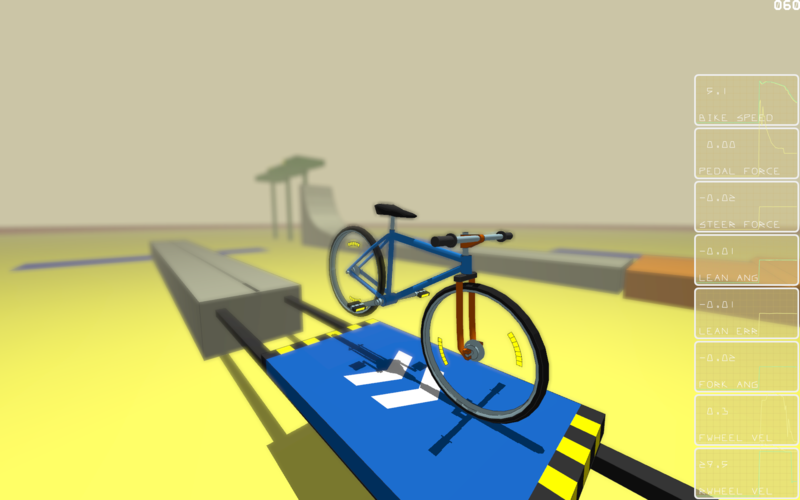 Properly explain how to wheelie, in level description. 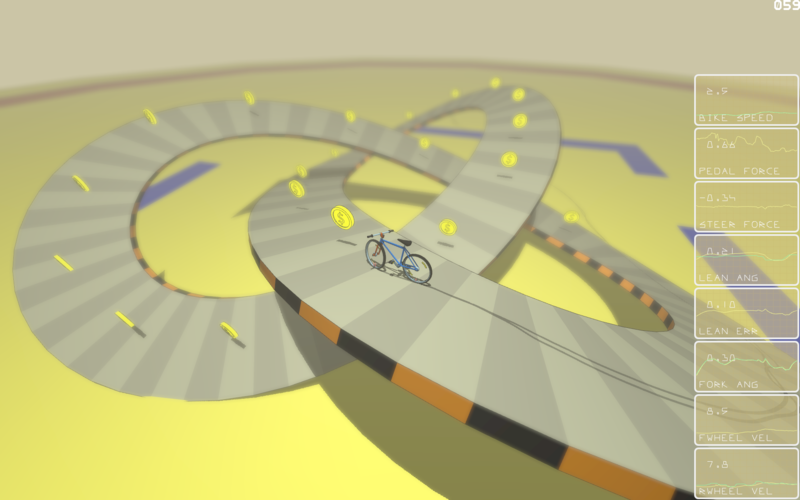 Properly explain how to negotiate turn-table in level description. Game models and 2D Artwork are (c)2017 by Abraham Stolk. Game is (c)2017 by Abraham Stolk. Sound files are licensed under Creative Commons 0, 1.0 Universal (CC0 1.0) and taken/resampled from the freesound.org site. VMath is Copyright (c) 2005-2009, Jan Bartipan. stb_image.h is a public domain image loader by nothings. Thanks. 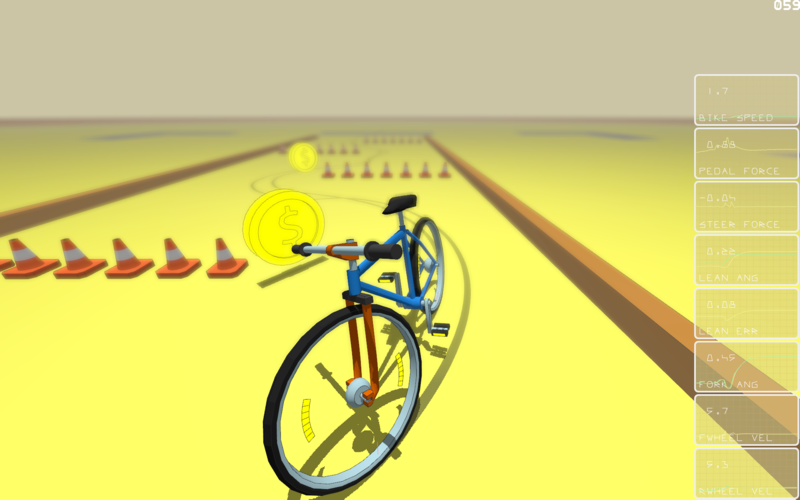 You mean the reflectors in the wheels, or the ones in pedals? All the bikes had those in the pedals, in the Netherlands, when I grew up in the 70s. I think you had to have them by law. PS: do you plan to make win32 releases of your other games?